Living differently means making a difference where you live. Imagine a completely different concept of living in Tallahassee. One where innovation, creativity and sustainability intersect. Where photovoltaic solar power helps minimize your carbon footprint, while native plants and gardens create a tiny oasis in the city. Welcome to the Freight Yard—a cyclist and pedestrian-friendly community built from upcycled shipping containers and other ultra-green materials. 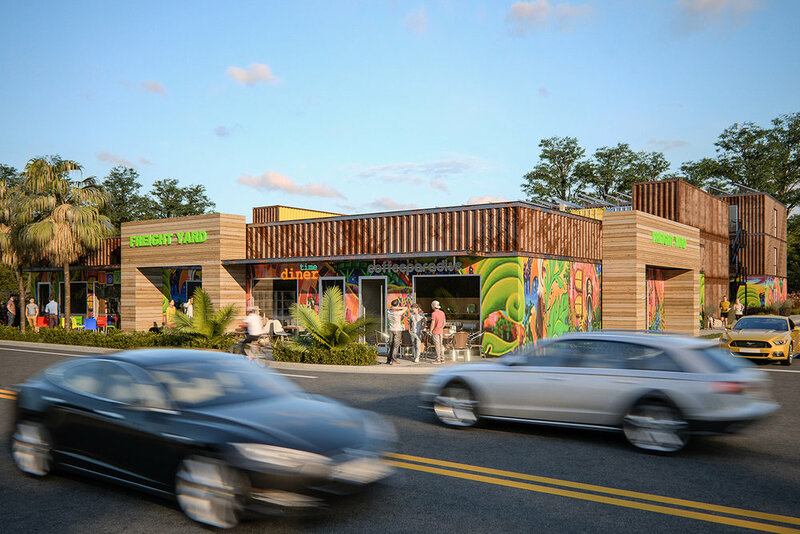 With 28 apartments, a courtyard, five retail stores and restaurants, and room for pop up stores — all within a conveniently walkable distance to the city’s largest employers, an organic grocery store, and myriad restaurants and bars—the Freight Yard is more than just a mixed-use development; it's a place where Tallahassee’s creative class can live, work, and play in a fun and stimulating urban environment. The Freight Yard is not simply the sterile co-location of residential and commercial uses; it’s designed for these uses to relate to each other in a personal and positive way. In that sense the Freight Yard is designed to be beyond mixed use. Like a natural ecosystem, each part of the Freight Yard is made better by the interplay with its neighboring parts. Residents, patrons, restaurateurs, artists, merchants -- all will spend part of their week living in and around the Freight Yard’s courtyard, a small community that spontaneously grows from the unique architecture of the place. Living it up in Tallahassee's art district.